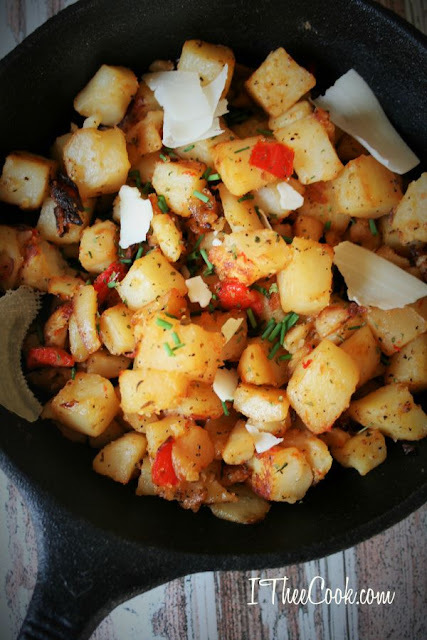 Nothing screams comfort food to me better than potato hash. The best part is you can have it for breakfast, brunch, lunch, dinner or heck snack on it. 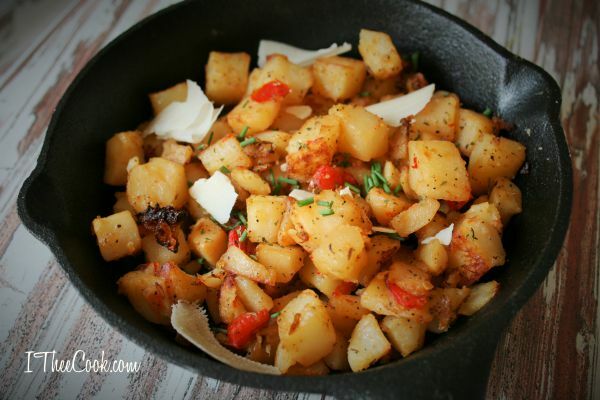 If you are a starchy carb lover like me then this is a perfect AM dish to go alongside an egg or two. With that being said Hash doesn't just need to be an AM thing. Brunch, lunch, or even dinner oh yeah and br-inner. You can pretty much add anything to it next time I think I will add some bacon. Bacon makes everything better. Heat the oil in a large nonstick skillet over medium heat. Add potatoes, toss to coat with oil, and place a lid on the pan. Allow the potatoes to cook covered for 10 minutes. Remove the lid and increase the heat to medium high. Add onion and bell pepper. Cook for 15 minutes, stirring occasionally, until the potatoes and vegetables turn golden brown. Add the oregano, thyme and garlic; cook for 2 minutes. Season with salt and pepper. Sprinkle with Parmesan and serve immediately. Your potatoes look delicious. I love doing breakfast for dinner at least once once in awhile...now I am craving potatoes with a perfectly cooked runny egg on top! Your Potato Hash looks fantastic! Hope you are having a wonderful day and thanks so much for sharing your awesome post with Full Plate Thursday! Congratulations! This post is going to be featured over at Diana Rambles tomorrow and has been pinned in the Featured at Diana Rambles board at Pinterest, Tweeted, Yummed, and Stumbled. Please grab a featured button off my button page or via the post guidelines graphic. Thanks for sharing this awesome idea!